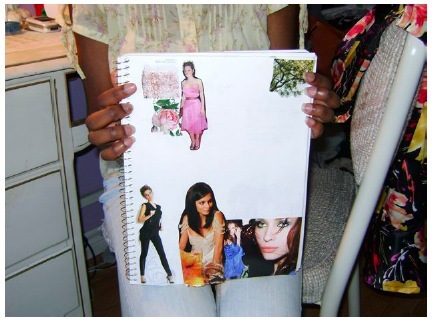 This is a raw, under-edited, not peer-reviewed, pre-published version of “The Fashionable Lives of Young Women: Home and Beyond,” a research paper I produced for a course at U of T called The Information Experience in Context (INF 2305). We pretended to be Information Scientists for about a month and a half, using ethnographic tools to study local information phenomena in hopes of uncovering the “red thread“. The field I chose to study was fashion, because, well, it was a topic I knew I wouldn’t get sick of by the end of this project. Two lovely ladies allowed me to picked their brains on what fashion information meant to them. Then they showed me their closets. It was fantastic. The study includes a research framework, ethical protocols, a lit review, photos, diagrams, discoveries — the whole works, baby! Oh, except for a hypothesis. Ethnographers are too cool to make educated guesses before venturing into the field. If you happen to read past the introduction, then thank you, dear reader. If not, please take two minutes of your time to get all click happy at Juxta-posing and Honey Bliss. fashionista, I think some girl with big sunglasses walking around with a lot of shopping bags,” said Monique, an up-and-coming fashion designer and a fashionable young woman by default. Natalia, an amateur style blogger, also avoids that label. In fact she flinched a little when I said it to her. “Naaaaaah… I guess I never considered myself as someone fashionable,” explained the self-described “reformed nerd”. We scraped the term for a lighter, current, and ambiguous one: fashion enthusiast. spotted strutting their shiny new Louboutins along trendy downtown streets. They could be hunting and gathering at a suburban mall, equipped with their keen eye for detail and colourful array of credit cards. They could also be a friend of yours whose hobbies include reading Teen Vogue, watching The Hills on TV, searching for the occasional deal on eBay, and posting photos of her favourite ensemble on Chictopia.com. That was the case with Monique and Natalia, promoters of personal style, who not only consumed fashion information, but also passed on their sage wisdom to others on the Internet. Both women are working professionals in their early twenties who live in Toronto. Monique, a pharmacy technician by day, designs outfits in her spare time. She launched a fashion line called Honey Bliss in early 2010, selling her handmade clothing on Etsy.com. Natalia is a newspaper editor, a “chick in a band” (rock band), and runs a what-I’m-wearing type blog called Juxta-posing. While the two may be extremely passionate about their hobby, fashion information is a part of many people’s lives, in various degrees, as a means of self-expression as much as a duty that human beings put some clothes on. young women and what role it plays in the home and online environment. As a fan of fashion myself, I examined Monique and Natalia’s fashion spaces with analytical eyes, focusing on the different types of fashion information that were available and how people interacted with them. By discovering what fashion means in these special cases, we can gain a better understanding of the popular leisurely activity that touches the hearts and closets of many women around the world. The topic of women and fashion in modern Western culture has yet to be explored in Information Science. However, fashion enthusiasts mirror the habits of those partaking in serious leisure. Stebbins (1998) defined this as a systematic pursuit of an activity “that participants find so substantial and interesting that, in the typical case, they launch themselves on a leisure career centered on acquiring and expressing its special skills, knowledge, and experience” (p. 3). Furthermore, this interest may entail everyday life information seeking (Savolainen, 1995). primary experience of most women in relation to their clothing consists of the individual confronting her wardrobe or shopping experience with the problem of, ‘What on earth should I wear?’” (p. 192-193). Moreover, they proposed that women experience social pressure and anxiety that determines what they wear. While this does not lead to any indication of what type of information women seek out, Clarke and Miller (2002) recognized that even highly knowledgeable individuals of taste and clothing found everyday encounters of aesthetic choice difficult. The experience is socially mediated. fashionable female friends as possible. About five people expressed interest in the project, but due to time constraints, only two were selected to be key informants in the study. shopping street. The other was in a house in a suburban neighbourhood at the edge of the city, only close to bigbox stores. Prior to the interview, both participants were asked to send over any links where they published original content online. Each interview session lasted about three hours. It included a guided tour and direct observation of their fashion spaces. There were some jottings and mapping of the homes, but both subjects gave permission to tape record the interview, take photographs and videos, as outlined on the University of Toronto Office of Research Ethics consent form. As well, both were comfortable being identified in the report. Other data gathering techniques included a survey of resources they turned to for fashion information and some document analysis of their online presence. onto computer documents. In total about 150 photographs were taken and two 5-minute videos were uploaded in order to help remember stories and locations. Follow-up questions were sent via email after the meetings. It should also be noted that the interviews were conducted over the summer months when it was warm enough for people to be more inventive with what they wore. All of a sudden it was just like, “Hey! Clothes are exciting again!” I wasn’t limited to shopping at three stores where I knew I could find pants that fit okay. All of a sudden it was something I could explore more and play with and try different shapes and combinations. Natalia, who is drawn to the vintage-inspired style, immersed herself in fashion by picking up magazines, such as Vogue, and reading blogs, such as What I Wore. Style, it appears, is something that can be learned when time is invested in acquiring fashion knowledge. It can also be accidental. At the interview, Natalia wore a black short-sleeved dress from H&M, a grey vest she picked up at The Clothing Show (an event held in Toronto twice a year featuring local designers) and a pair of Oxfords from Browns Shoes. The dress and vest fell off their hangers that day, and so she decided to wear them. socialize. Natalia discovered a community of style bloggers and in February 2010, started her own website, Juxta-posing, where she posted self-shot photos of her outfits, discussed fashion finds, published store profiles, and wrote about local events (Figure 1). By the end of July there had been 61 posts. The reason for starting the blog was to document the experience and broaden her style horizon. Natalia’s goal was to do one things that she had not done before in each blog post, she said. It differs from other style blogs in that she writes in the perspectives of those with a shoe-string budget, instead of in the approach of those who are “filthy, stinking rich.” Here, it must be noted that there are many different – and hierarchical – views of fashion information; what one gravitates to is a question of taste. Figure 1 – Natalia’s website. Above: Natalia posts photos of her outfits, fashion discoveries, favourite stores, events, and more. Style blog she reads most frequently are listed on the right-hand sidebar. When I was in Grade 7, I did not care about fashion, clothing or anything. I just wore things my mom picked out. People are school told me there were certain things I had to wear, and I thought it was the stupidest thing ever—because they were “in”. I wore red skinny jeans, and apparently they were so wrong. Because of that experience I didn’t care about fashion. Her perspective on fashion changed in 2005 when she was 17 and learned how to sew her own clothes. Her mother taught her the basics, and she would sign out books from the library or use the Internet to look for tips. Monique has two sketchbooks. One for items for her wardrobe, another filled with designs for Honey Bliss, her handmade clothing line. Some pieces end up in both books. A sketch often includes a drawing of the item (usually a dress), measurements, and step-by-step written instructions on how to make the piece. It also may include an estimated cost for material, a sample cutout of the fabric, poetry that she thinks reflects the item, or sometimes song lyrics (Figure 2). Each item is tied to music in some form. While sewing, Monique would play the song that she felt matched the outfit. This ritual illustrates that fashion information can be multisensory experience similar to that of consuming art. Figure 2 – Monique’s sketchbook. Above: Monique keeps two sketchbooks of which she fills with her designs, instructions, poems, fabric patterns, and collages. interview, however, was not one of them. Dressed in a short-sleeved button-up floral top and a pair of light denim jeans, she fits the style she is very much into at the moment: feminine and girly. Nature is her muse when it comes to designing new pieces for Honey Bliss, but it is also reflective of her own style. Aside from showcasing her designs on Etsy, she has a lookbook, blog, Facebook fan page, and YouTube channel. The videos she posted are short, homemade clips on how to create a fashion piece or how to wear one. Educating others on fashion seems to be a way to turn an enthusiast into an expert. interest, and how they share the information suggests fashion information is not merely about clothes. The learning process may encompass memorable incidences of discouragements, a creative outlet to share the experience, and most often interaction with the fashion community over the Internet. results were combined and summarized in a table in Figure 3. Natalia consumed a total of 18 sources while Monique used 20 of them in various degrees. Figure 3 – Fashion sources. This brings me to the question as to what is fashion information? Pictures were considered crucial to fashion information, which may be why the sources that were always used were highly visual. The occasional sources, such as local events or videos, depended more on context and are harder to copy information from. Although both subjects did read editorial or commentary in magazines and blogs, text-heavy resources were the least attractive of all, probably because fashion is a show-don’t-tell type of field. computer folder), or saved mentally in one’s memory (e.g. street sighting). One of the dresses Monique designed was inspired by a piece she saw on an episode of the TV series Privileged. She Googled the show and the dress to find out who the designer was. She was able to successfully locate it this way. There appears to be many connected elements to fashion information, such that it goes beyond the idea that it is what I wore, what she wore, and what everyone else is wearing. Fashion information, perhaps, is a concept that pertains to information seeking, information retrieval, and the creative process that makes one want to be inspired. Fashion is constantly changing, presenting new ways of viewing clothes and accessories, which is likely to be what is fueling the information-seeking behaviour of these young women. 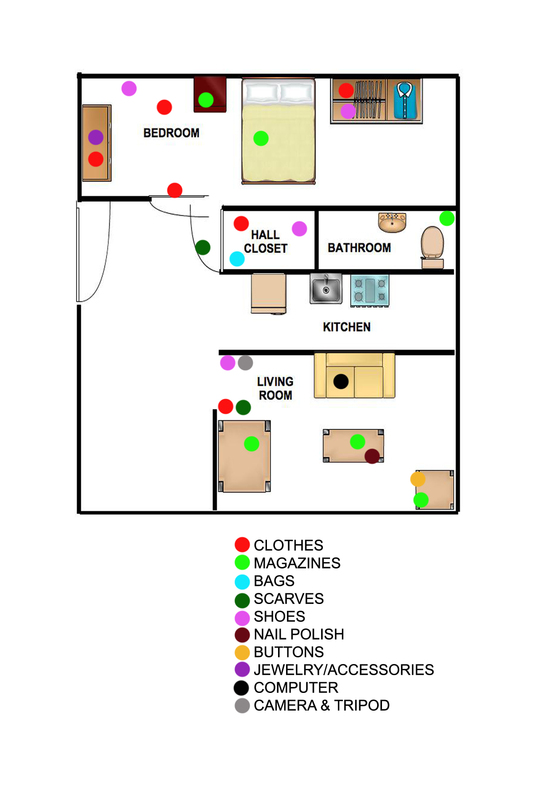 spaces within the home, and see what the participants considered to be fashion information (Figure 4 & 5). There were an average of 11 “spaces” in each home. I defined a fashion space as an area where a fashion item can be placed, such as a bed or a table. Key components were the closet, magazine areas, and the computer. Figure 4 – Natalia’s fashion spaces. Above: Types of items are indicated by colour. Clothes and magazines occupied the most space and were scattered throughout the home. Figure 5 – Monique’s fashion spaces. Above: Monique had a bigger variety of fashion items than Natalia, but less space to put them. The Closet – The closet and dressers were obvious hot spots for fashion information. Natalia kept most of the old clothing she did not fit into anymore in her bedroom closet, as well as many jackets, sweaters, dresses and shoes (Figure 6). T-shirts filled her dresser drawer. Jewelry was kept in the top drawers of the dresser as well as in two small containers. The closet in her hallway was a storage space for shoes (owned about 20-30 pairs), jackets, bags, and scarves. The pieces were organized by type of item (i.e. shoes, shirt, dress), and the only weeding of clothing occurred once to bring to a clothing swap. A dress she meant to resell on eBay hung from the bedroom door. It was too much of a hassle to post it on eBay, she said. Figure 6 – Natalia’s closet. Above: Bedroom closet (left) contains mainly winter wear. A dress that might be sold on eBay hangs from the bedroom door (middle). Bags full of scarves are kept in the hallway closet (right). closet contained clothes that she bought as well as many she made for herself. The items were organized by type and then she matched them by length. For example short-sleeved shirts were kept together. Long sleeves and dresses had their own section. The clothes kept on the right side of her closet were items that needed to be fixed. Her dresser contained clothes for Honey Bliss, packed and ready to ship out when it came time. She had a storage bin with three drawers filled with accessories. They were kept in small boxes and her favourite ones were labeled in order to locate them quicker. 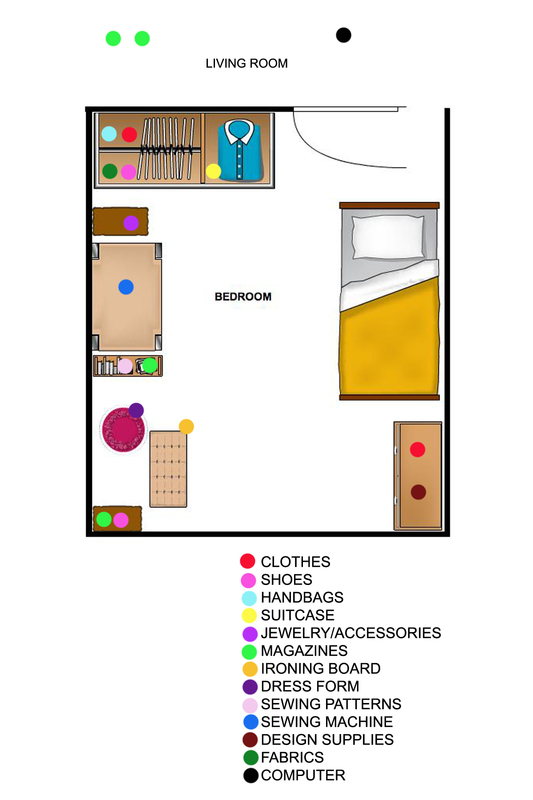 Figure 7 – Monique’s closet. Above: Organized with pants on the left, then jeans, short-sleeved button-ups, long-sleeved tops, dresses, cardigans, jackets, and on the right are items that need fixing. Magazine Areas – Both homes had an abundant of magazines. Natalia had 6 places where magazines were kept. Monique had 4 places, but mentioned that there were some old ones stored in her basement. They both enjoyed teen magazines, Canadian titles, and some international titles. Monique also kept Asian magazines, catalogues, and lookbooks in the magazine racks (Figure 8). Figure 8 – Magazines. Above: Magazines that Monique keeps, which include a mix of Canadian and foreign titles. Computer – The two women both considered their computers to be a fashion space. Natalia used her laptop more for browsing and publishing, rarely to store images or data, even for her blog. Monique had a Microsoft Word document on her home computer with a list of 39 shopping websites, 10 independent sites, 4 fashion portals, and 8 of her favourite fashion designers (collection name and her own commentary included). She kept images in 4 file folders (photo galleries) with labels such as “Fab Outfits n Pieces”. She would rename each file, calling it, for example, “Fabulousgirlyfromcitytocountryoutfit.jpg”. Aside from pictures for her fashion line, she also saved photos of nature, models posing, celebrities, and even outfits she spotted on fashionable friends (Figure 9). Figure 9 – Computer folders. 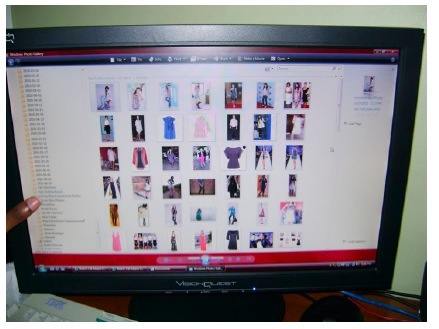 Above: Monique stores fashion finds on her PC, renames them, and views them as a photo gallery. typical home. What it does not depict is the usage pattern of this information. Nor does it tell us how a lot about the evolution of one’s wardrobe. While both informants had stories associated with each fashion piece, it was difficult to extract how much it meant to them without viewing the outfit in context. This was where the online component came in. Some fashion pieces found in their closets were photographed by the subjects themselves and posted on their blogs, alongside comments and stories (Figure 10). This type of recordkeeping could be the bridge to understanding a layer of fashion information that direct observation does not reveal. Figure 10 – Fashion information in context. Above: Two pieces from Monique’s closet (left) is transformed into a blog post (right). In this ethnographic study, two information-rich cases helped to dissect the role of fashion in the homes and virtual lives of young women. The bumpy beginnings of the fashion infatuation may reflect the anxiety issue that Clarke and Miller (2002) identified. There was a wide range of information sources, which suggests fashion knowledge is a timeless, formless concept, rather than a material entity. Fashion spaces blossom in every corner of a home, and technology is connecting enthusiasts to a world that offers more than what can be experienced in real life. An in-depth study of fashion spaces may resemble discoveries found in other home hobbies such as cooking and Arts & Crafts. There is much to be explored in fashion, but one must look beyond the superficial and see the similarities in individual differences. Clarke, A., & Miller, D. (2002). Fashion and anxiety. Fashion theory, 6(2), 191-214.
seeking in the context of way of life. Library & Information Science Research, 17(3), 259-294. Stebbins, R.A. (1998). After work: the search for an optimal leisure lifestyle. Calgary, AB, Canada: Detselig Enterprises.